The calcineurin inhibitors that organ transplant patients take to prevent rejection may also work to prevent Alzheimer's disease. A new study at the University of Texas Medical Branch at Galveston (UTMB) examined the rate of Alzheimer's disease among 2,600 organ transplant patients. Results were compared with a 2014 national dataset from the Alzheimer's Association. Regardless of patients' age or which calcinerurin inhibitor they took (tacrolimus or cyclosporine), the organ recipients were far less likely to develop Alzheimer's disease than the general public. Among members of the general population, 15.3 percent of those over the age of 75 had some type of dementia, including Alzheimer's disease. Among solid organ recipients over the age of 75, the study found just 0.6 percent had dementia. Findings for patients over 65 were remarkable as well. While 11 percent of the general population had dementia, only 1.02 percent of organ recipients in the study did. "These data clearly show that the prevalence of dementia and Alzheimer's in our transplant patient group is significantly lower — in fact almost absent — when compared to national data from the general population," said senior author Dr. Luca Cicalese, a professor in the department of surgery at UTMB. To this point, researchers have found no cure for Alzheimer's disease, the most common neurodegenerative disorder in the United States. Evidence suggests that toxic protein aggregates called Amyloid beta oligomers selectively target and disrupt the points of communication between brain cells, thereby disrupting memory in people with Alzheimer's disease or dementia. Many researchers feel if the toxic protein aggregates can be prevented or lessened, Alzheimer's can be as well. That's where calcineurin inhibitors come into play. The enzyme calcineurin regulates communication between brain cells and the formation of memories, and elevated calcineurin levels are found in the nervous system of Alzheimer's patients. In prior studies at UTMB, blocking calcinerurin in mice helped restore memory function. Conducting a study on humans has proven difficult though, as calcineurin-blocking drugs also suppress the immune system. That's why researchers at UTMB turned to the medical records from 2,644 solid organ transplant recipients. This patient group must take calcineurin inhibitors for the rest of their lives to prevent organ rejection. And to ensure treatment compliance among transplant recipients, follow-up medical care always looks for evidence of memory loss or dementia. 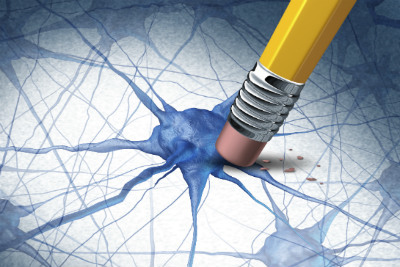 "Taken together, our findings from these people confirm the data obtained with animal models and support, for the first time in human subjects, our notion that calcineurin inhibition has a protective effect on the development and possible progression and even reversal of Alzheimer's disease," said senior author Dr. Giulio Taglialatela, professor and vice chair for research in the department of neurology and director of UTMB's Mitchell Center for Neurodegenerative Diseases. "Therefore, we are currently working on devising treatment strategies to obtain the same beneficial effects in AD humans using low doses of calcineurin inhibitors that result in minimal or no immunosuppression, thus limiting possible undesired side effects." Complete results will be published in the July 7 edition of the Journal of Alzheimer's Disease.